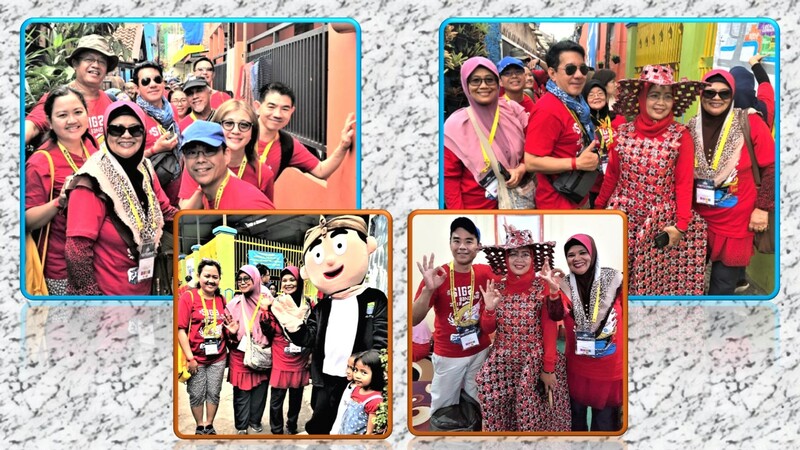 Some 230 delegates from Asean nations and Japan spent a gainful time in social and economic activities at the SSEAYP International General Assembly (SIGA) 2018 in Bandung, Indonesia, from 20 to 22 April 2018. Bandung, the capital city of West Java Province, is a well-known centre for learning and creativity. The Singapore contingent, 49 in number, comprised former SSEAYP Participating Youths and National Leaders, officials from the SSEAYP International Singapore and foster families of SSEAYP or the Ship for Southeast Asian Youth Programme. This year’s assembly, the 30th, carries the theme “In the spirit of art, heritage and youthpreneurship”. The theme offered lively panel and group discussions on the three aspects of the theme. SIGA is held annually in Asean countries. In the last two years, SIGA was held in Cambodia (SIGA 2016) and in the Philippines (SIGA 2017). This was my third participation in SIGA though my wife and I have been annually hosting the participants of the Ship for Southeast Asian Youth Programme (SSEAYP) for over 20 years since 1989. SSEAYP Homestay: My daughter, Munirah Shaik Kadir (centre), flanked by Shaliza Azlim from Malaysia (far left) and Mazrina Md Yusuf (from Brunei Darussalam) at my home in 1998; and departing from homestay with us is indeed sad and emotional with Kimie Endo (Japan) from SSEAYP 2003. Hugging her is my wife, Khairon. “Part 1 – SIGA 2018: An assembly of wisdom, contribution, togetherness and fun”, published last week on 19 May in this blog, carried a number of photos that gave a glance of the delegates, divided into groups, participating in workshop discussions and presentations of their findings as well as their participation in youthpreneurship activities. Khirul Ariffin at the Bakery Academy during Youthprenuership activity. (1) Thank you so much for the article. I’ve read the article and it sums up the activities we did back then. Salam, and have a great Ramadan.” – Fatimah Zakiyah, Indonesia. (2) “It was a great article! The report would be a strong motivation for the readers who were former Participating Youths and officials to to join SIGA .” – Aiko Saito, Japan. 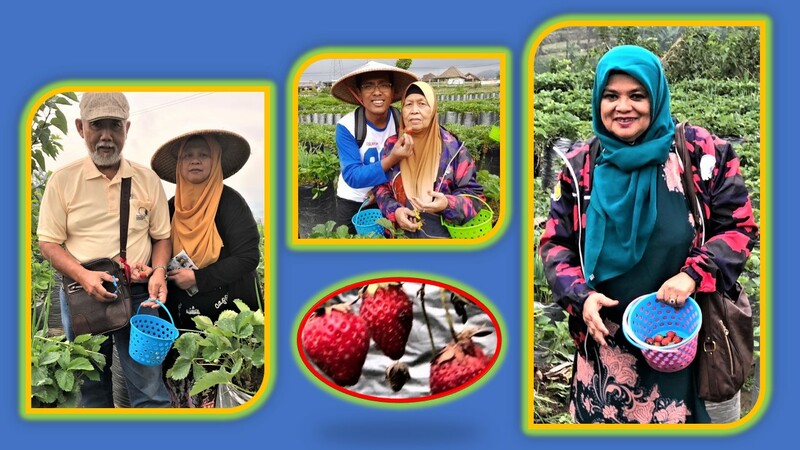 In this Part 2 segment of the article, photos of the participants taking part in out-door activities, like visits to a strawberry farm, Kawah Putih hot-spring lake and social contribution at Cibunut Village, are presented. 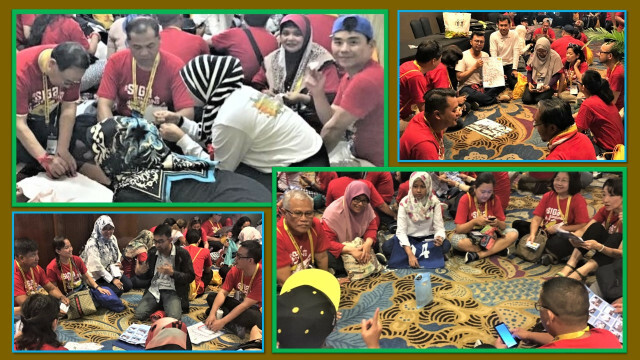 The following photos provide a glimpse of togetherness and fun the participants had when participating in the activities. 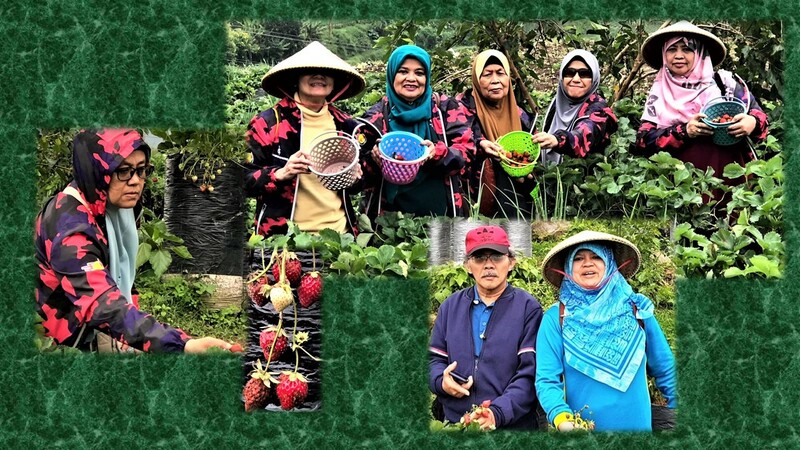 A group of 15 people, in the spiritual of discovering Bandung, went to a strawberry farm, Bambooberry, where they could pick, if they want to, as many strawberries as they desired, and purchase them by the kilogram. 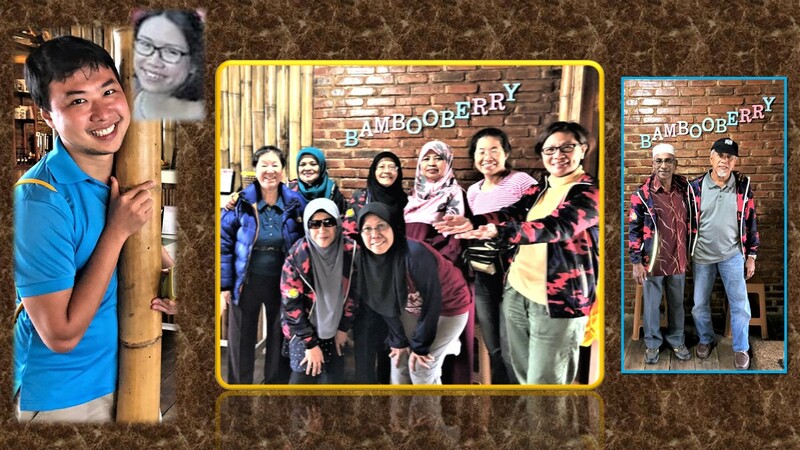 At the Bambooberry strawberry farm, some decided to take a photo first. 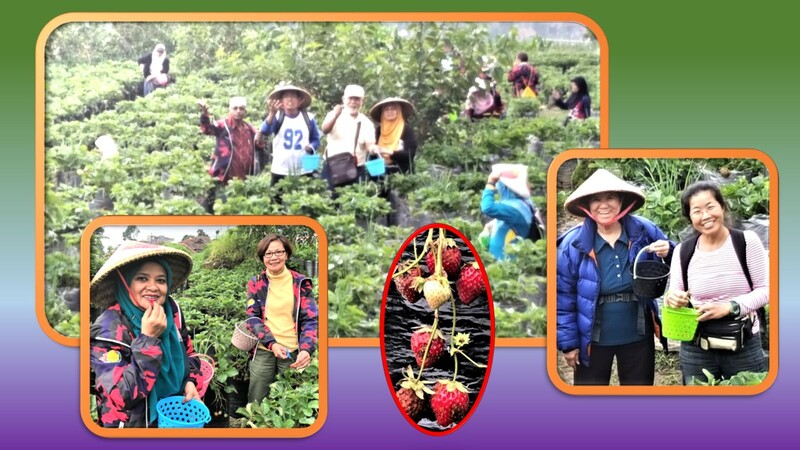 Well, while the others look happy to begin the strawberry picking in the farm in a while, Mr Desmond Yew looks so forlorn; yes, he’s dreaming of his wife, Lynn, who was not able to join SIGA Bandung for a very good reason. Happy picking, eh, even eating to taste the strawberries fresh from the plants! Why look so stern? Why not sing a Hindi song and chase each other in the farm. Picked so little! Enough or not? 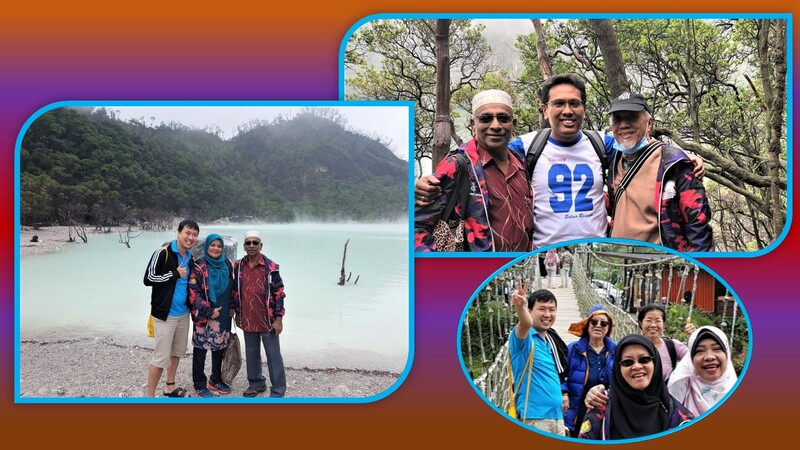 The Singapore delegates, during a “choice in the visit programme”, took the opportunity to go to Kawah Putih (White Crater) which features a large and beautiful lake of clouded turquoise mist. 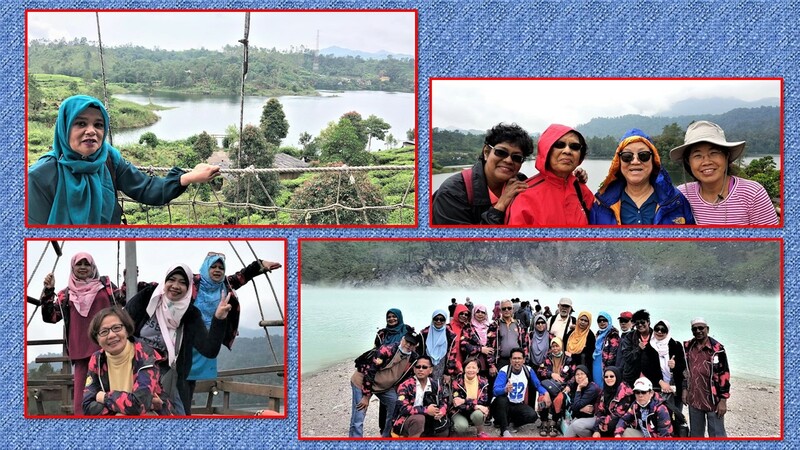 The group also explored the area and enjoyed the stunning view of the lake and tea plantations around them from the hanging rope bridge. An appeal by the forests of Kawah Putih to save not only them but also all forests in the world. A nice view of the lake and the surrounding from the mountain-edges and the hanging rope bridge. Another stunning view of the lake from the hanging rope bridge and from the edge of the vapouring hot-spring lake. 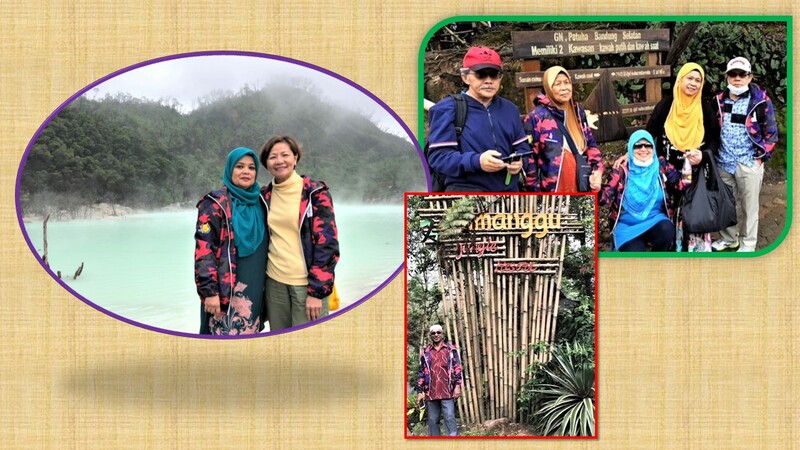 It is nice to take photos in the Kawah Putih area, especially with the “sulphuric hot-spring” lake in the background. Are they auditioning for a Bollywood (Hindi) movie with singing and dancing at the edges of the lake??? 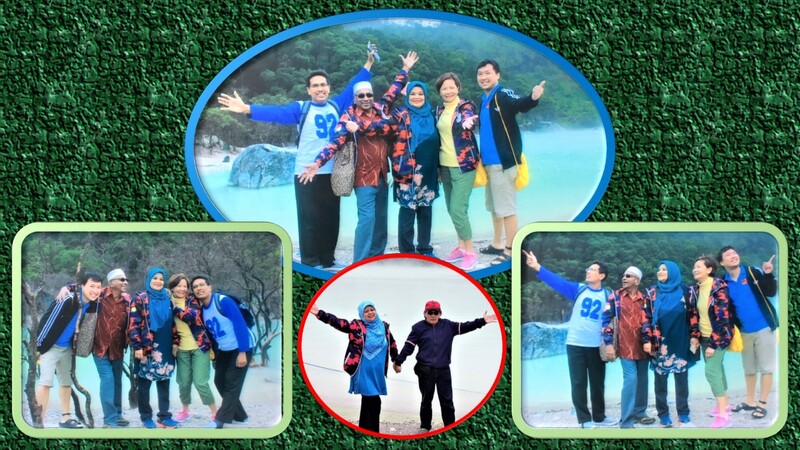 “Let’s take a group photo here, right at the edge of the hot-spring” someone suggested and nobody disagreed. Cibunut Village or Cibunut Berwarna (Colourful Cibunut) is an environmentally-friendly village that aims to have zero-waste. Indeed, the village has sections of villages houses painted in different colours like orange, green, blue and so on with their walls showing equally colourful eye-catching murals. To this beautiful and unique village the SIGA Bandung went to assist the community to achieve their objective of managing waste and to contribute in some social activities like upcycling waste, cooking traditional dishes and managing the organic waste, door-to-door campaigning in waste management, making biopores (infiltration holes) and painting murals. 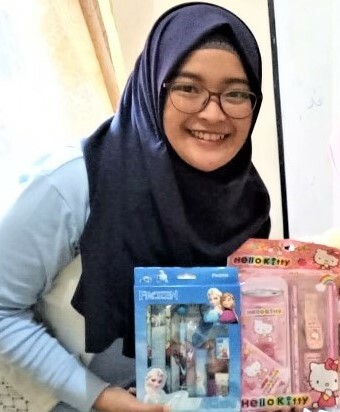 Ms Icu Surtini with some of the gifts for the children of Cibunut. “I was mesmerised to see how excited the Cibunut residents were to welcome the SIGA 2018 Asean and Japan delegates to visit their village. I learnt a lot from this community, especially in their dedication to create zero waste and eco-creative village. I cherish their strong bonding and togetherness in carrying out the waste management project. Despite the language barrier, it is heart-warming to see the Cibunut people and the SIGA participants interacting very well. I received positive feedback from SIGA participants that they enjoyed their time in Cibunut, a very colourful village. Also, from the Cibunut side, they were once worried about serving their best to the visitors, however, they could feel that they were well-accepted by the visitors and were very happy about it. I love their hospitality and genuine heart to support SIGA. To bid goodbye after the activity in Cibunut was a melancholy moment for me. It reminded me of my SSEAYP homestay days. How I wished I could stay longer with them. 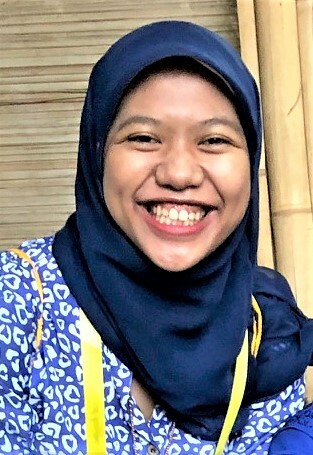 – Ms Icu Surtini Marwati, an Indonesian delegate in SIGA 2018 who was a Participating Youth of SSEAYP 2012 and Assistant Youth Leader of the Indonesian Contingent of that year. Currently she is the Director of Social Contribution Activities of SSEAYP International Indonesia. In SIGA 2018, Ms Icu presented their project, “Retype for Brighter Literacy”, which was dedicated to Indonesia’s blind and partially-blind fellow-Indonesians. 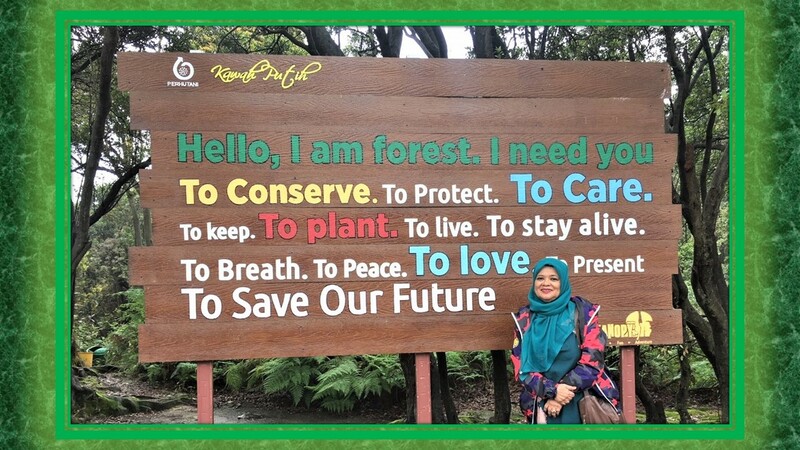 Ms Fatimah Az Zakiyah hopes that all Indonesians would keep Indonesia clean and green. “Participating in the 30th SIGA Bandung was an unforgettable experience. I am a first timer in SIGA and I realised that the activities were good and interesting for youths to gain knowledge and experiences. The activities made us more confident about ourselves in promoting our ideas and countries to others. The friendship gained and knowing different cultures make the world a better place to live without any concerns about race, religion and culture. The delegates were friendly, and the ambience of this event was good. It gave me confidence to talk to some of them from the Philippines, Japan, Brunei Darussalam and Singapore about Bandung. As a local citizen of Bandung, I was proud to tell Bandung’s history and arts. 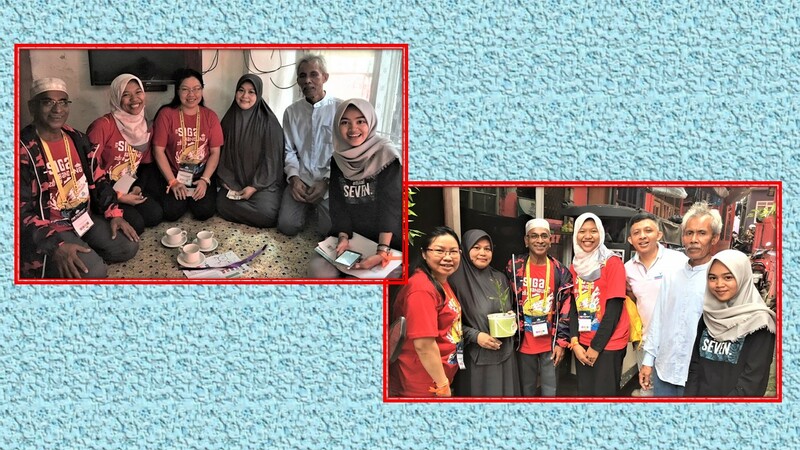 – Fatimah Az Zakiyah, a medical student at the Bandung Islamic University, who is a volunteer for the Cibunut Village visit during which she accompanied Ms Keeoudone from Laos and Mr Shaik Kadir from Singapore for the door-to-door waste management discussion. Being a native Sundanese, she translated English to Sundanese/Indonesian when Ms Keeoudone spoke while Mr Kadir spoke in Malay which was understood by the hosts. Happy to have arrived at the Cibunut Village, also known as “Cibunut Berwarna” (Colourful Cibunut), to offer social contributions. 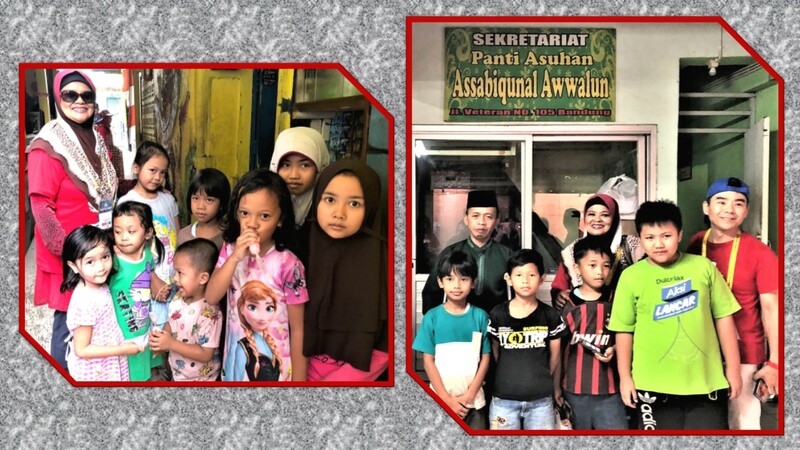 SIGA participants with children of the Cibunut community with Indonesian delegate Ms Icu Surtini Marwati handing over a box of gifts for the children to the village chief. 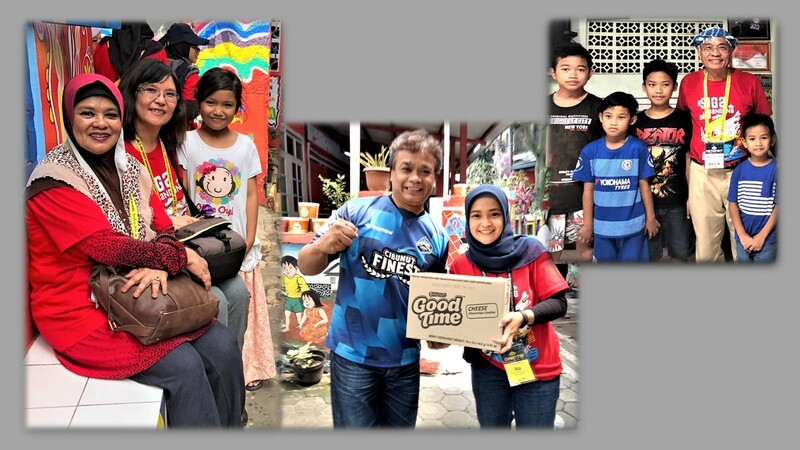 Mdm Khairon (far left) and Mr Joey Koh (far right) meeting up with Cibunut community’s children to offer them gifts. SIGA participants, apart from giving the children gifts which they had brought with them, also in small groups together with the adult villagers made a number of art and craft items like brooches and small handbags as well as did some cooking. Art and craft: SIGA participants and Cibunut villagers involved in making items like bags and fancy dresses from recycled materials, including cloth, paper and plastics. Waste management discussion at the home of a family in the Cibunut village.. 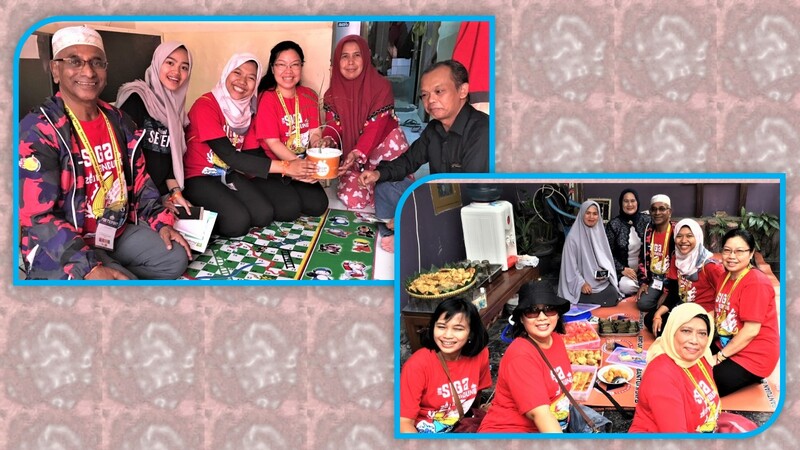 The photo on the left shows (from left), Singapore delegate Shaik Kadir , Indonesian Cibunut volunteer Ms Fatimah Az Zakiyah, Laos delegate Ms Keeoudone, the husband and wife hosts and Ms Yati, another Cibunut volunteer. Waste management discussion at another home in the Cibunut village, and then the foursome went to yet another home where snacks had been prepared for them. 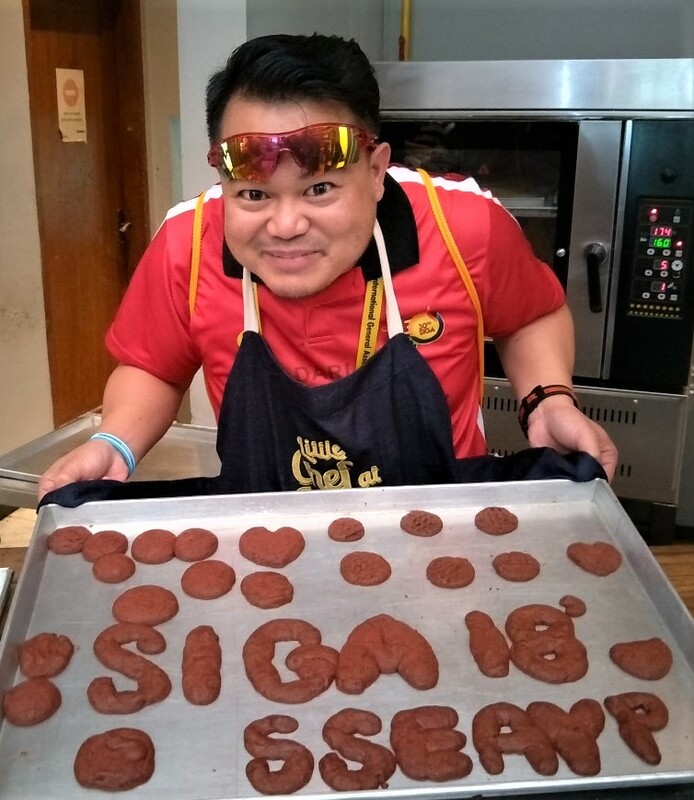 The SIGA 2018 delegates had indeed enjoyed the activities prepared for them, and of course, made lots of friends along the way. However, there are still some more SIGA activities that have to be mentioned in this 3-part article, and that will be done in Part 3. Look out for it as it will be published soon in this blog. By the way, we are still in the holy month of Ramadan, so may I again wish all Muslim readers of this article “Ramadan Kareem” and may you continue performing your heightened worship, charity and righteousness and receive Allah’s blessings. 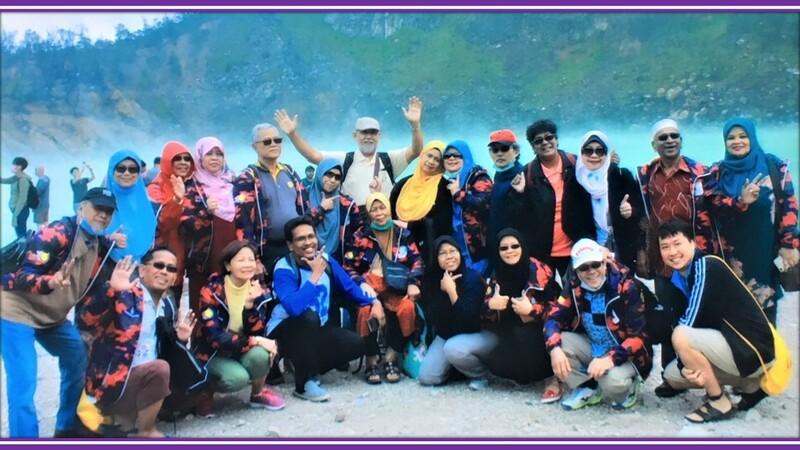 This entry was posted in General interest (Wide-ranging) and tagged Bandung, Cibunut Village, hotsspring, Kawah Putih, SIGA 2018, SIGA Bandung, SSEAYP. Bookmark the permalink.